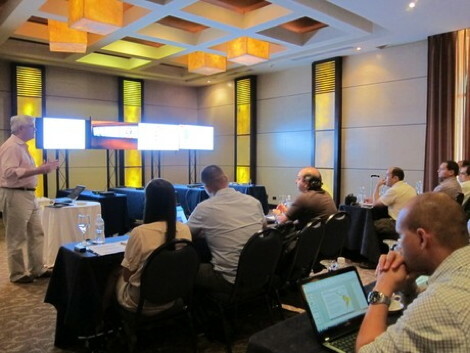 Last week ComQi held its annual Latin America partners’ event in Punta Cana, Dominican Republic on April 12th – 13th at the beautiful Melia Caribe Tropical resort and we didn’t even get an invite! The event was organized exclusively for ComQi’s system integrator and network operator partners and ComQi’s latest distribution, content management and interactive technologies were showcased. Participants came from all over Latin America and Europe, representing Chile, Colombia, Dominican Republic, Mexico, and Spain and ComQi launched a certification program at the event for its accredited partners. In addition to showing these innovations, the event also covered global and Latin American digital signage industry trends and launched a series of webinars on a variety of topics including Industry Trends, Lowering the Cost of your Digital Signage Network, Solutions Overview, and more. Prior to next year’s LATAM partners’ event, ComQi will be awarding the Webinar attendees with the highest frequency of participation partnership awards. This entry was posted on Monday, April 16th, 2012 at 08:55 @413 and is filed under Scuttlebut. You can follow any responses to this entry through the RSS 2.0 feed. You can leave a response, or trackback from your own site.